Kia has revealed its all-new hybrid Niro at the Geneva Motor Show. The crossover will reach the UK in the autumn and start at £18,000. Fuel economy will exceed 70mpg, while emissions will dip below 89g/km of CO2. 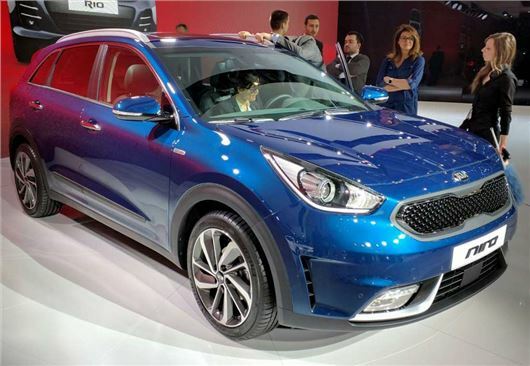 The Niro will be hybrid only, Kia’s new 105PS 1.6-litre ‘Kappa’ GDI engine coupled to a 32kW electric motor and lithium-ion polymer battery pack. Power will be transferred to the front-wheels via a a six-speed twin clutch automatic transmission, which has been specially developed for the hybrid. Kia says the Niro will be its first "dedicated eco car platform," as the company looks to carve out a reputation as a manufacturer of green cars similar to that Toyota enjoys. It’s estimated that total hybrid sales will exceed 700,000 in Europe by 2020. Smaller than a Sportage but with a bigger wheelbase than a Cee'd, the Niro promises to be spacious, with space for four adults. The boot will boast 421 litres of space, along with room for a full-size spare wheel beneath the boot floor.